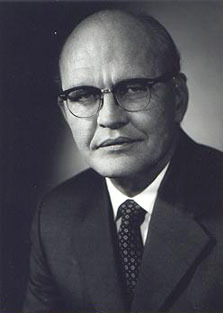 American electrical engineer Jack S. Kilby was the inventor of the integrated circuit. He came up with the idea — that an entire circuit could be constructed from a single piece of silicon with no connections, simply by employing different doping levels — while working alone at Texas Instruments (TI) in 1958, while the lab was on a company-wide two-week shut-down. He promptly designed, molded, and tested the first integrated circuit, and had a working sample by the time his co-workers returned to the lab. Mere months later, an integrated circuit of a different design was invented by Robert Noyce, and the two scientists (and their employers) battled in court for years over the patent rights. Kilby and TI won in court in 1967, but Noyce and Fairchild Semiconductor won on appeal the following year, and Noyce went on to co-found Intel Corporation. Kilby, however, won the Nobel Prize in 2000, an honor never accorded to Noyce. Kilby also invented the semiconductor-based thermal printer, in 1965, and led TI's team that developed the first calculator based on integrated circuitry, in 1967. The device, code named "Cal-Tech", was about the size of present-day laptop computer, and it could add, subtract, multiply, and divide, with a capacity of eight digits before the fixed decimal point, and four digits after. Unfortunately, it required literally dozens of integrated circuits, rendering the device simply too expensive to be manufactured and sold at the time, so it was instead used only for technical demonstrations. Kilby's TI integrated circuitry was used in Canon's Pocketronic, the first consumer calculator, introduced in Japan in late 1970 and in America in early 1971. Retailing for about $385, it helped eliminate much of the demand for slide rules and mechanical adding machines. The integrated circuit, of course, became the backbone of the 20th century's electronics explosion, allowing the development of advanced medical diagnostic equipment, cell phones, digital watches, DVDs, personal computers, and video games, among myriad other uses.